Rock ‘n’ Roll Adventures (Wii) – This is one of Data Design Interactive’s many very low budget EU PS2/PC-to-US+EU Wii ports released in ’07 through ’09. This one is one of the 3d platformers, along with Anubis II and Ninjabread Man. The games are extremely short, 4-level 3d platformers with some annoying motion controls and gameplay-wise play pretty much like N64 or PS1 games in the genre. I still like those games, so I don’t mind this, and actually wanted to try one of these to see if I’d enjoy it — “It’s kind of Nintendo 64 3d platformer-like” is something that makes me WANT to try a game, not want to not try it. 🙂 So I got this game a while ago and having found this one cheaper than I’ve seen those other ones for, but hadn’t actually put it in the system until today. Wasn’t exactly expecting much, considering the awful reviews. I beat it an hour or so later, but I actually had fun along the way and there are some additional modes to play, so it was worth my $5. This game’s not that bad, really, it’s just incredibly short. The number one thing people seem to have complained about is the jumping controls. If you read the manual and the ingame control explanation, it tells you to jump by waggling the nunchuck. You attack by swinging the Wiimote (left, right, or down work, up doesn’t). Move with the analog stick. Your only speeds are a barely-moving crawl or a full-out run, there’s really nothing in between — makes some of the platforming a little harder than it should be, but I do like how fast he moves, at least if you miss a jump you can get back to where you were quickly (one bad design decision partially compensating for another bad design decision, perhaps? :)). Press B to go into aiming mode so you can shoot. Problems are, first the Wiimote swinging is extremely poorly done and fails to recognize my attacks a lot of the time (this causes you to take way too many avoidable hits, and I know the Wiimote can be responsive, it just isn’t in this game), and second, the nunchuck-waggling for jumping is imprecise and hard to get right. At least the nunchuck is responsive in that when I shake it Elviz (your character, the Elvis clone) jumps, but he often double-jumps right off, which is a big problem because lots of jumps in the game require precise double-jumping, so if it’s wasted at the start you will fall. Over and over and over. At least when you fall you won’t die — there’s no jumping over bottomless pits in this game, you fall to a lower platform and then try the segment again. Very nice, particularly for anyone trying to play the whole thing with waggle jumping. If you’re the kind of person who doesn’t like a game where you have to run around and try the same jump 10 times because you need to do it just right to clear the jump, though, you won’t like this. Wario Land 2 haters need not apply? 🙂 I found it a frustrating in a few points, but fun anyway overall. Oh, the camera’s not great and does get messed up, particularly after you try to return to normal play after using the gun, but one of the dpad directions centers the camera behind your character, so it’s not an issue. You’ll just have to center the camera regularly (during jumping puzzles particularly), but that’s fine, in my opinion. The first level is a tutorial. After that, there are three real levels of average length. 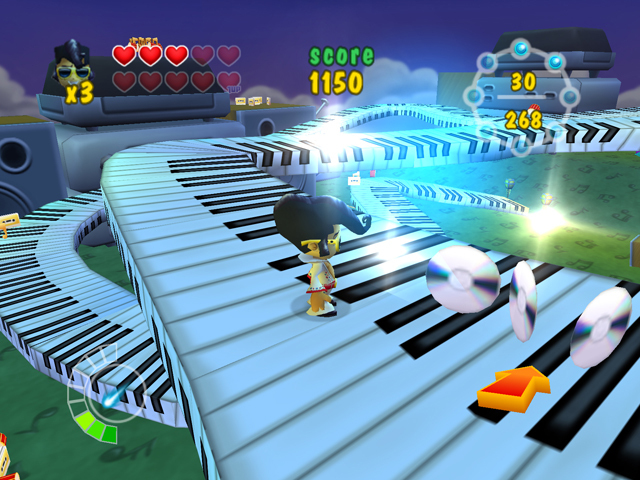 To beat each level you need to collect the eight platinum CD items and then get to the exit. The levels are largely linear, but there are some simple puzzles, and lots of jumping, along the way. There are just three kinds of enemies, and all four levels have the same graphical theme. The drum and cymbal enemies are just a minor nuisance, but the tape recorder is ar pain, you can’t jump on them (that’s the easiest way to kill enemies, given the bad wiimote-swing recognition) and they shoot at you, too. The levels are reasonably well designed and are fun to play through, I enjoyed playing through the game. I did have to restart a level once, in level 2, because I got stuck between two platforms and couldn’t get out. That was annoying, but it did only happen that one time and there is a ‘restart level’ option from the pause menu (and it was just a couple minutes into the level too, so I didn’t lose much progress). Other than that the game ran well, at least the game isn’t horribly buggy even if it is seriously lacking in content. There are no bosses in this game. Once you beat the four levels you’re just sent back to the main menu, there’s no ending or credits (you can watch the credits from the main menu whenever you want, they aren’t shown at the end of the game). DDI’s other platformers do this as well, I’m pretty sure. Pretty lame. However, at least you do unlock something — in each of the three main levels, you unlock several extra modes. First is an item-collection mode with lots of stuff to collect scattered around the level. You choose three difficulty settings, and that determines the percentage of the stuff you need to collect. It’s funny, playing through the first time I didn’t even notice that the game was missing collectibles other than the health-ups you get for killing enemies and the platinum CDs, must say something about that I was enjoying myself. The game is more fun with them though, a full game with these pickups there by default would be a better game than this. This mode also gives a purpose to the various nooks and crannies in the levels that are just empty in the main game, now they have stuff in them. 🙂 Of course there’s a downside, though — there’s not much point. The game doesn’t save your score or best total or anything, so all you get for winning is the satisfaction of having finished it. Great. The second mode is time attack, where you have to finish the level in a specified amount of time. There are three difficulties, each with a shorter timer. This mode’s actually tricky, lots of cassette players shooting at you and a clock ticking away… again though your time, if you finish, isn’t saved. 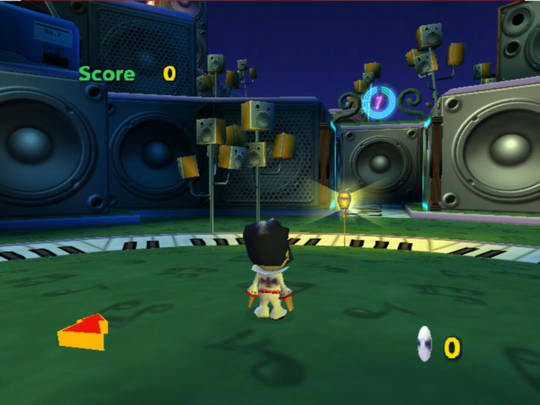 The last mode requires you to find 20 “hidden items” hidden in the levels. This is the hardest of the three unlockable modes, because the items are better hidden. The manual claims that you need to beat each one of the three hidden modes to unlock the next, but in the actual game that’s not the case — beating each level in the normal game simply unlocks all three modes. I wonder why they removed that, between the time they wrote the manual and finished the game, it’d have been nice because it’d give you an actual reason to want to play the extra modes beyond just trying to challenge them. But I like 3d platformers, and jumping between platforms is what they’re supposed to be about, right? I prefer 3d platformers that are actually platformers to the so-called “3d platformers” that are actually 3d action games, such as Ratchet & Clank and the second and third Jax games. I don’t mean this game is better than those, it’s definitely not, but on a conceptual level I do prefer traditional 3d platformers to those kinds of games. There aren’t enough true 3d platformers this generation. Basically, my point is that only fans of the 3d platformer genre should consider playing these DDI games, but if you do like 3d platformers and can find the games for a couple of dollars, maybe think about picking them up, as long as you know about the drawbacks. It won’t last long, but I at least had enough fun to think it was worth the time. I might go back to try to finish the other modes, I haven’t beaten most of the extra modes yet. And I think I want to try the other US Wii DDI 3d platformers too, if I can find them cheap I’ll probably pick them up as well. As for a score, because of the severe lack of content I don’t think I could give this game a score above a D, but I did like it while it lasted. IGN seems to be the only site that reviewed this game (here: http://wii.ign.com/articles/841/841408p1.html); they gave it a 3/10, but didn’t notice that there actually was a jump button, not just the shake-the-nunchuck jump mechanism. They also didn’t mention the additional modes you unlock. Heck, it doesn’t even mention that the game has only four levels, pretty shoddy review. The fact that there is a jump button has to raise the score some above that. But I guess I’m a little lenient on games I enjoy, I don’t often give games failing grades… but in this case it’s just that what’s here is decent, for a classic-style 3d platformer, it just needed a lot more of it. But of course, I do love the N64 and that style of 3d platformers, so I don’t mind the 5th gen 3d platformer-style gameplay at all. DSI probably should have made one actual full game instead of a bunch of hour-long ones, but evidently they thought that this way would be more profitable, unfortunately. The Wii has many better 3d platformers than this game, but even so I don’t regret playing it. I do wish that they’d mentioned the jump button in the game and manual though, it’d have saved the few people who actually did play these games some frustration. Score: D+. Bad but fun game! This is the best of the three DSI Wii 3d platformers I have. This entry was posted in Full Reviews, Modern Games, Nintendo Wii, Reviews and tagged Conspiracy Entertainment, Destination Software International, DSI, Nintendo, Nintendo Wii, platformer, Rock 'n' Roll Adventures, Wii. Bookmark the permalink.